Scarlet, aka Scarlet Moon, is a 3-year-old female born to sire, Aimin by Design, and dam, Gable Shiny, on February 18, 2003. Scarlet's racing career was brief, consisting of 46 races at Raynham Park in Massachusetts. Boasting a beautiful light fawn coat with a touch of black highlights, Scarlet is a charmer and and is taking her new role as a southern belle quite seriously. She'll flirt for your attention and reward you with a grin that stretches from ear to ear. Scarlet is small animal and cat tolerant. 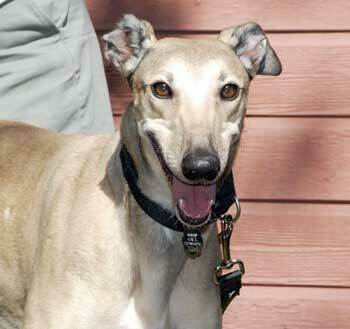 Our Miss Scarlet is a beautiful light fawn greyhound with unusual dark markings. This southern belle would make a wonderful addition to any home. She gets along with big dogs, little dogs, and kitty cats. That in itself makes her a winner, and to make her even more wonderful she is sweet, outgoing, and affectionate. Her house manners have been perfect. She mastered the dog door the first day and has had no accidents. She stays off the furniture; however, she would likely love to snuggle with you on the sofa if you so desired. Scarlet loves to chill with her family and she wants to be in the same room with you. A nice cozy bed on the floor with her humans around, and Miss Scarlet is good to go. Especially after taking her walks, which she also really enjoys. Of course she does well on a leash. Scarlet also enjoys an occasional car ride, and she rides beautifully. When it comes to toys her preferences are the ones that squeak. She really has herself a big time playing with her toys. When it comes to treats she does indulge herself, and she happily goes in her crate knowing a treat is coming with her. 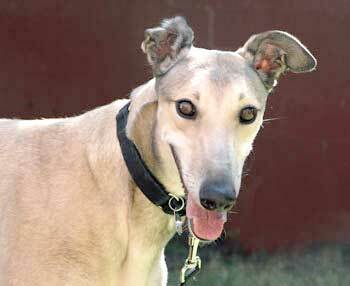 May I just say this greyhound is just about perfect. She happily co-exists with her four-legged companions and her humans. She is a champion car rider, and has lovely house manners, enjoys playing with her toys and crates very well. I hardly know what more one could ask for in a greyhound, and she is very cute to boot. So please come and meet her because she is a charmer.